A very quick post today since I could only sneak in a very few minutes of computer time on my daughter's laptop while she is busy with her books and all! I just wanted to share a Teacher's thank you card.. 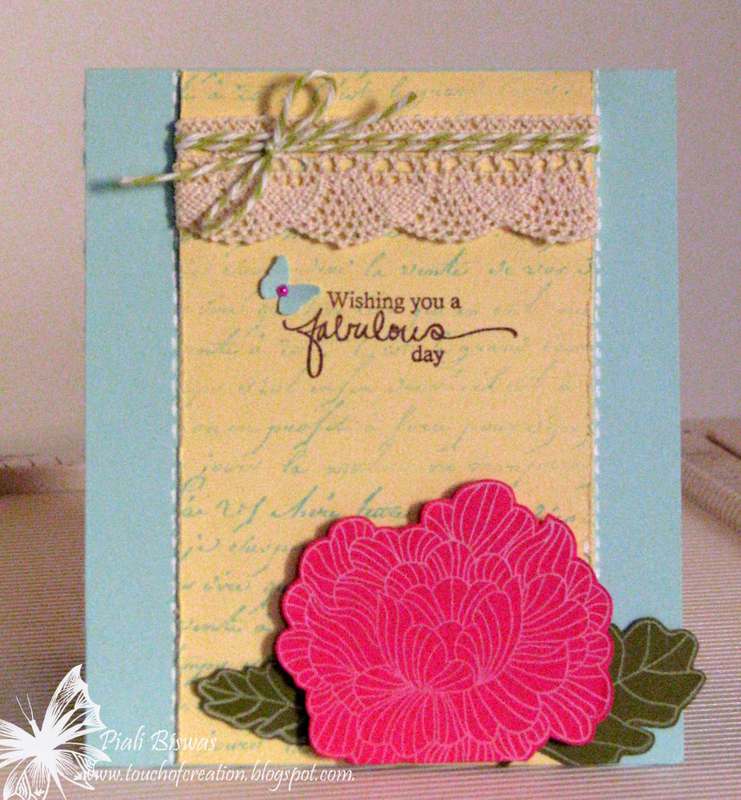 I used the fabby Pink Pailsee ...Summer Hometown papers and Tiffany's sketch for this card. Love this Pink Paislee collection...so fun!! The girl image and sentiment is from Papertrey Ink. Moving Along With The Times: Anything Goes. New Kiddies at Pink Cat Studio!!!! 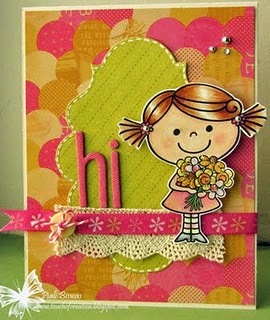 Its time another Cute digi Release from PINK CAT STUDIO.. 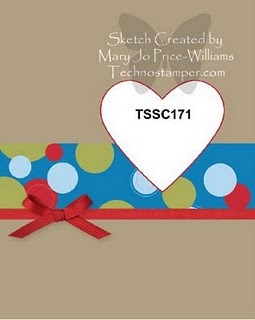 These new fun to color "Kiddies & Flowers" digi stamps are perfect for your Mother's Day, Thank You and just saying "Hi" cards. 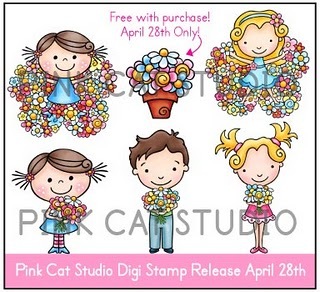 If you make a purhcase in the digi store today you will receive the "Flowerpot" digi stamp for free! 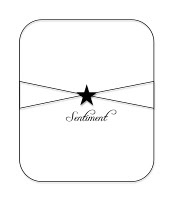 It will be emailed to you within 12 hours of your purchase. Creative Card Crew: Child's Play . 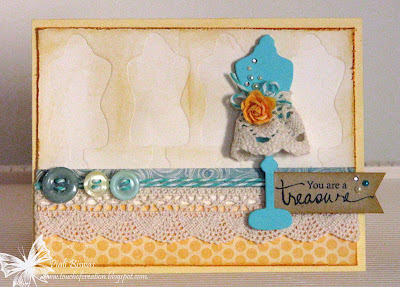 Stamping Vacation - Lay ribbon over lace . 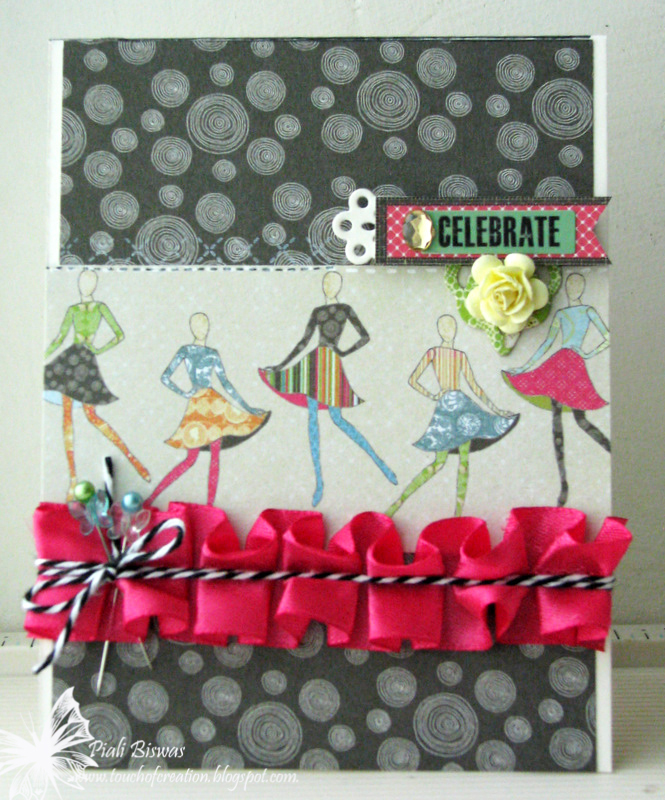 Make sure to stop by PCS Blog to check out the fabulous DT creations...I tell ya these Girls ROCK!! 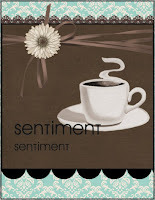 So I'll be on a bloggy BREAK!!!! See all after I get my laptop fixed! Sorry for the poor lighting....I need to get some white lights. 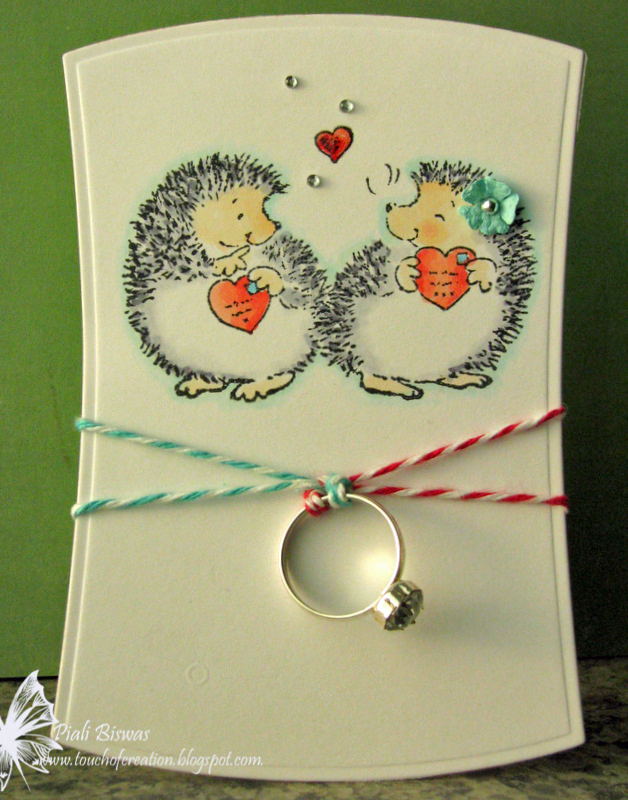 I love the Penny Black stamp-- Hedgies..they're the cutest!! 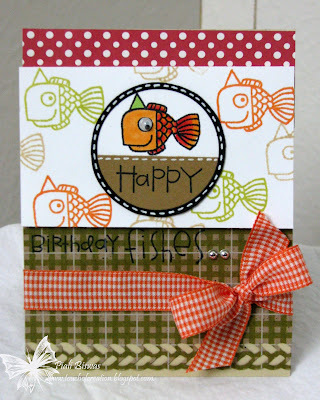 The card is cut using Spellbinders ~ Reverse Wonky Rectangle...fun name isn't it?? 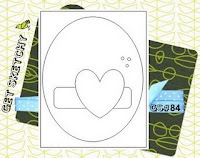 I love this shape for cardbase!! 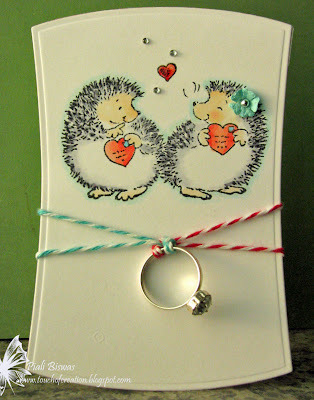 This is also perfect for Penny Black Saturday Challenge~ Happily Ever After Theme. Did you know Super Talented Torico ...one of the fab illustrator of There She Goes stamp have her own Digi store called Birdie Brown??? Yes She makes the cutest digi characters.. 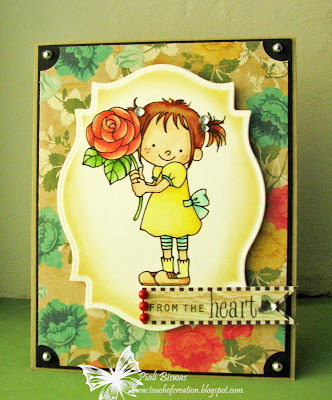 Here is one of her cute digi ---Girl with a rose !!! love her!! I used the gorgeous Crate Paper- Protrait collection and my new Spellbinders~Labels Eighteen die. 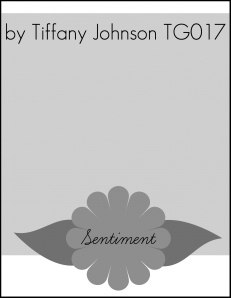 The sentiment is from There She Goes. I love blings on my girl...so added quite few blings and pearls from Pizzazz Aplenty!! Creative Inspirations: Use a Digi. 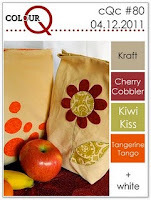 Check out for my April Blogcandy...HERE . I got a huge package from Claudia and Company last Saturday....yay!!! It my1st order from India...it arrived quite quickly( hope I didn't jinxed it...lol! )....got all the new released ( at least for me) papers!!! Okay!! As you all have noticed I mixed a lot of stuff together...and I think its work perfectly! 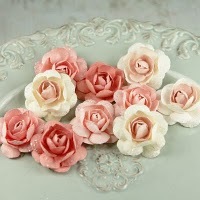 The gorgeous Bloomers are from Webster's Pages....love the color! The typewriter style alpha stickers are from Echo Park~ For The Record collection. Now the cute itty bitty butterfly is from Cosmo Cricket~ Salt Air Butterflies & Doilies pack...love them! 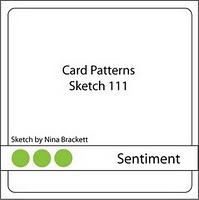 Sassy Lil' card sketches: sketch. Creative Inspirations Paint : Inspired by The Rainbow. Also added two cute Webster's Pages Butterfly push pins. Again no stamping at all....the sentiment is sticker from Echo Park~ For The Record collection. 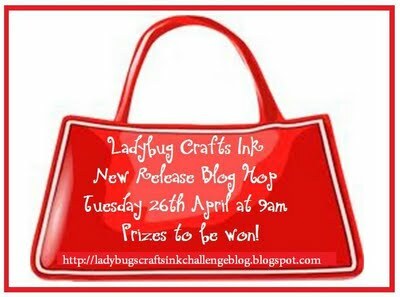 Ladybug Crafts Ink TLT Challenge: Fashion...They're also having a Awesome bloghop!!! 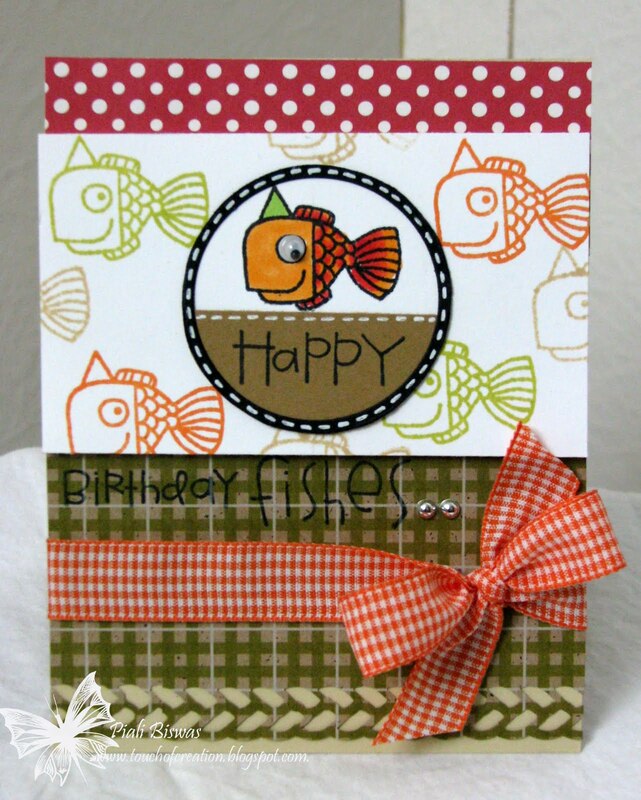 CCEE Stampers: Use pleated paper or ribbon. Make sure to visit Claudia and Company blog....our lovely DT gals have lot of inspirational projects for you all!!! Hope all had lovely weekend!! How about staring the week with some calorie free candy?? 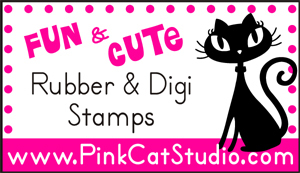 I've 5 FREE digis from PINK CAT SUTDIO for my lovely blog readers!! So please leave me comment by May 2nd...say anything or just Hi. Thank You Everyone for all your love & support!! 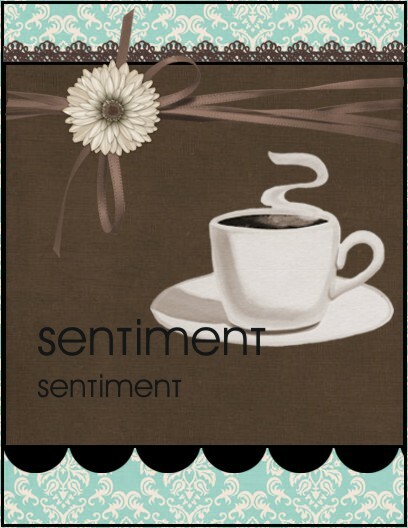 I really appreciate your comments...it makes my day!! Hope you all lots of plan for the Easter weekend!! 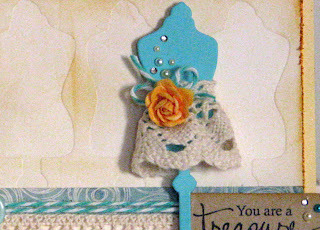 I used PTI~ Make It Monday technique, Card Patterns Sketch and Embellish Crochet Trim colors for this card... all three Fab challenges in one!! All products are from PTI...except the Prima flowers, a strip of My Mind's Eye~ Stella & Rose paper ,twine and blings. The pearls & rhinestones are from Pizzazz Aplenty. Next one is for Tiffany's Sketch challenge...its the last week's sketch. 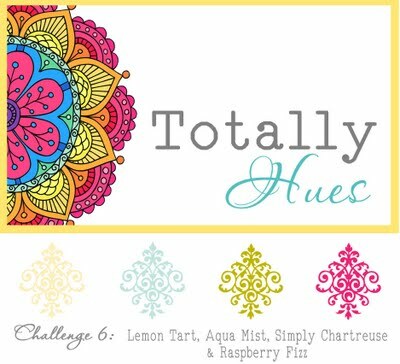 The lovely color combo is from Heather's Totally Hues#6 challenge. The Sweet Pea stamp is from There She Goes stamps. I love this set!! 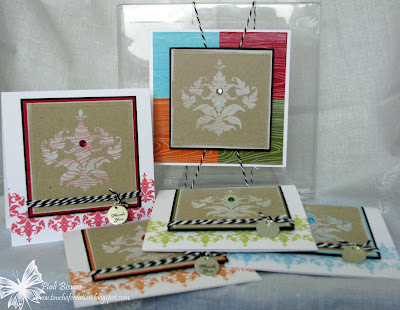 Pile It On : Use stamps. Made 12 of them...very Simple.. 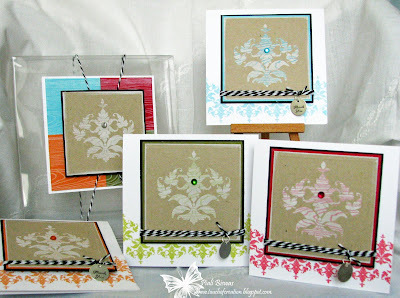 I really wanted to try out Kissing technique with woodgrain and Damask stamps...and I love how it turned out! 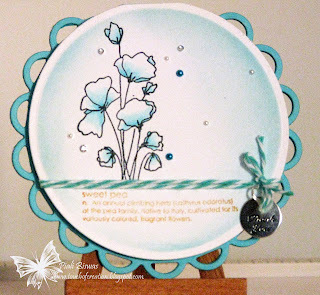 I used all PTI products ....I justed added one of my favorite product~ the Frosted pearls from Pizzazz Aplenty for a little sparkle. Sorry for the poor photography I really need to get a white light soooon!! 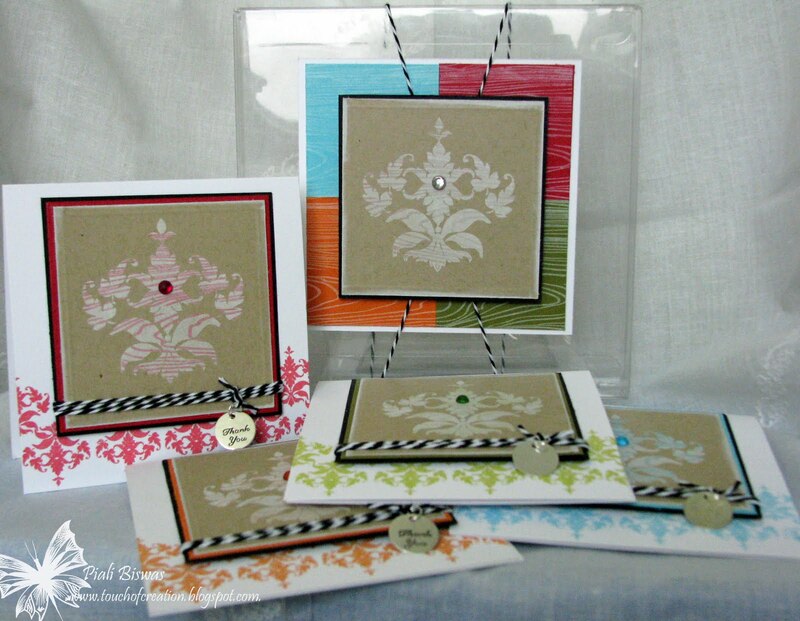 Today is the last day for Card Sets Challenge in the Moxie Fab World ...so I thought of entering this lil' set too! 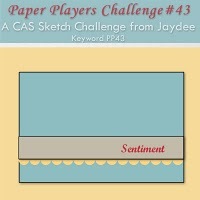 Today I've a CAS challenge for you all....oh no!! I didn't start a challenge blog but its the theme for Claudia and Company Bi-weekly Challenge.. 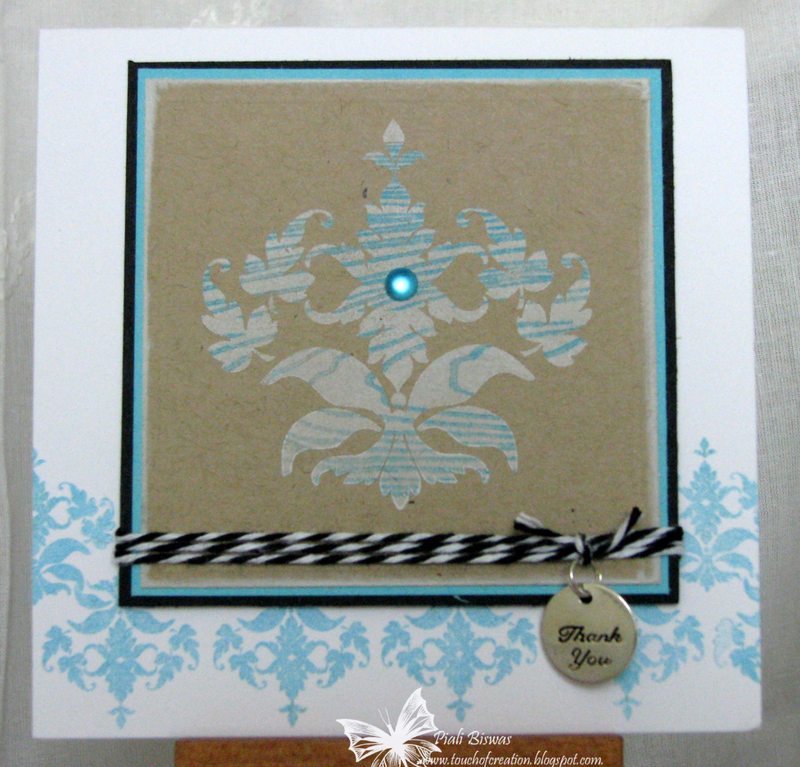 Here is a super CAS card...no stamping at all!! 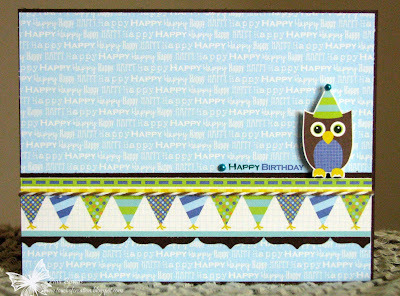 I've used Jillibean Soup~ Spotted Owl papers for a boy B'day card...with just a little brown Baker's twine & few Kaisercraft Pearls...thats it! Aly's Sunday Challenge: Bakers Twine. Card Ideas :Let's Hear It For the Guys. Yay!! Its almost weekend!! Our shipment is supposed to come tomorrow ..I've fingers crossed!! 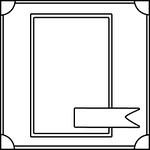 I need my sewin machine...can't make cards with it..lol!! Okay!! 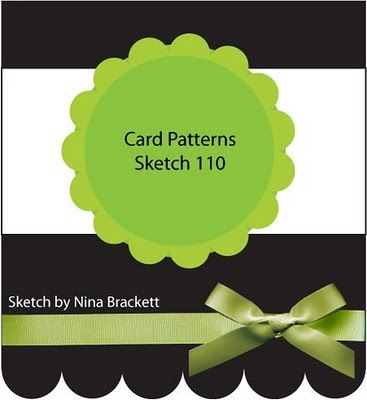 Today I've two different style of cards..as I always say..I don't have a particular style I just create according to what I feel at that moment. 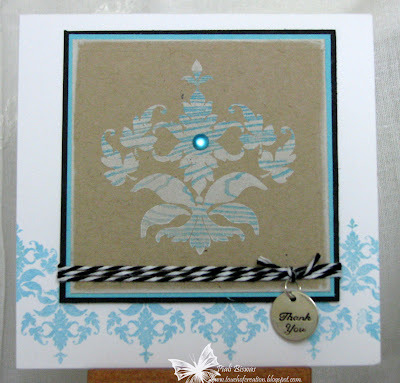 I used MME~ Lush and Graphic 45's Baby 2 Bride papers . The beautiful sentiment is from Paper Smooches~Pretty Pharses...love the font! I also used some gorgeous metallice twine from Pizzazz Aplenty! Now you all must be wondering what butterfly stamp is this??? Guess what I don't have my large butterfly stamps with so I created a DIGI with my PSE...I know this is not perfect ...but I like it!!! If any of you wanna use it for any of your projects.....you can download it HERE. 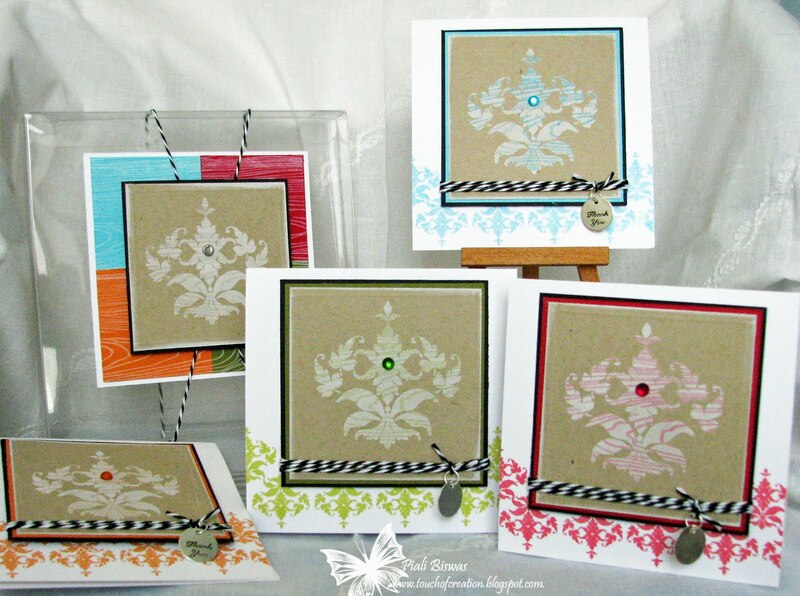 CCEE Stampers :Use pink & black. 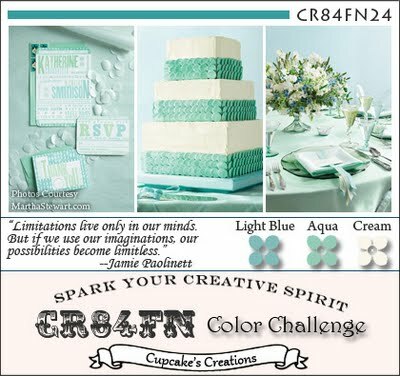 Colour Create ﻿: Pink, black, white. Paper Romance : Paper flowers..I used Making Memories paper flower with text print. 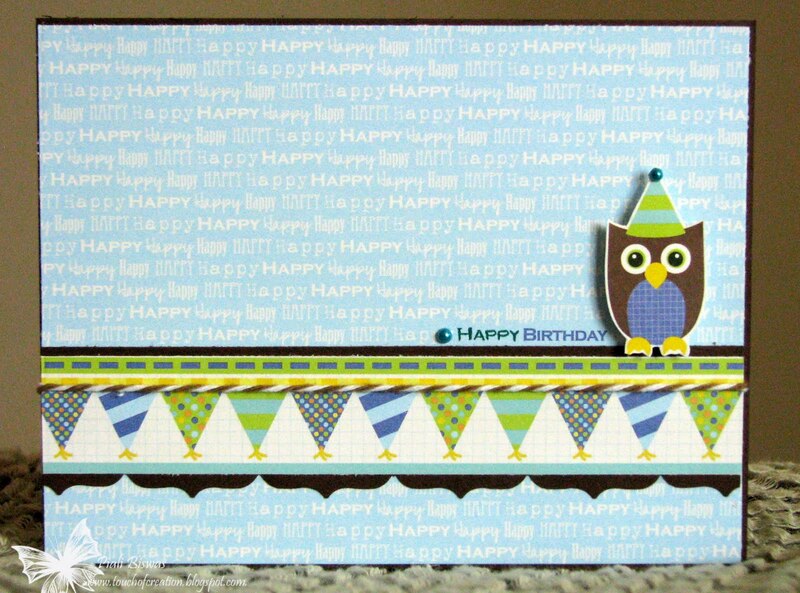 For this one I used another Paper Smooches stamp set--- Birthday Buddies ..absolutely adorable!! 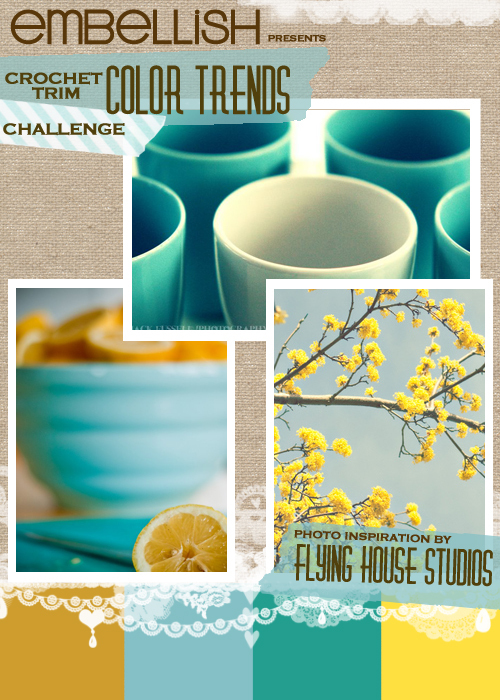 I paired up ColourQ's fun color combo with Card Pattern's Sketch!!! Its all about combos today! 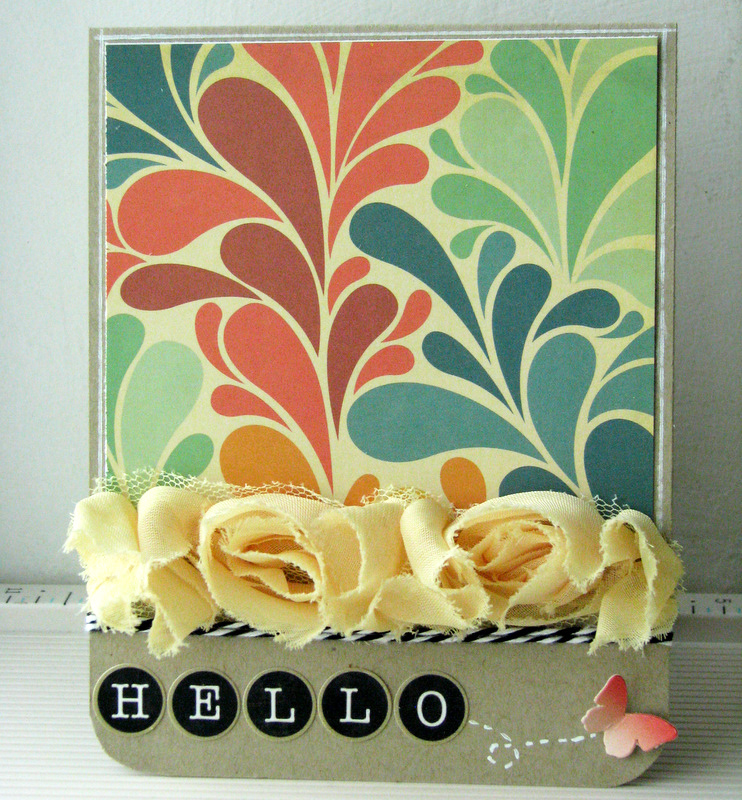 I combined Jillibean Soup~ Chilled Strawberry and Jillibean Soup~ Blossom Soup paper collections for this card! The yummy orange gingham ribbon is from Pizzazz Aplenty. AiFactory : Party animal (include an animal). 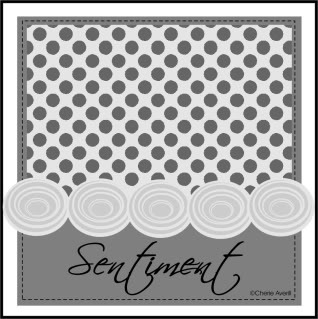 Aud Sentiments Challenge : Anything goes! Thats all from me today...enjoy your weekend!! 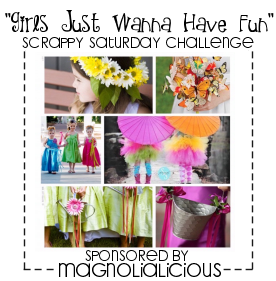 Claudia & Company Blog Hop!!! !